Being at the forefront of salon décor is a badge of honor that Takara Belmont USA wears with pride! So when it comes to giving tips on how to up your salon’s image, Takara knows what it takes. West Coast Regional Sales Manager of Takara Belmont USA, Shelia Crowder has seen many salons in her life—from small spaces with a few chairs to wide open floors with 30+ stylists at work at once. Here are her tips for making your salon look truly cutting edge! Set your salon, spa or barbershop apart from the rest with a branded approach from top to bottom. Space-planning, commercial design, beauty equipment, marketing and social media – a fully branded approach can sculpt the landscape of your business and pave a new path to success. 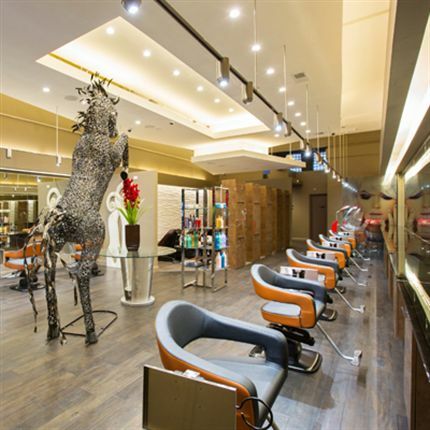 Trendz Salon, Cutting Edge Design Winner in Palo Alto, Calif. is a prime example of a branded design approach. From its logo features on single-use gowns and towels to custom designed glass countertops with illuminated logos and carefully selected equipment, the salon directly connects both brand and relaxing experience. Smart phone charging ports, mobile check-in and ergonomically designed seating can make all of the difference. Trendz is located in Silicon Valley, home to a bustling and booming technology industry, but they didn’t miss a beat and neither will their clients. The space is designed to provide clients with a lavish and modern experience, where tech-savvy clients can unplug and relax in a private loft area that overlooks the entire salon. The cutting edge salon opted for a full line-up of ergonomically-designed Yume shampoo units, which smoothly reclines from a seated position into a horizontal lounge position at the touch of a button. Similarly, stylists can also effortlessly raise, lower and adjust the position of a client with ease on all styling chairs equipped with an electric base. Mariposa Salon, Cutting Edge Design Winner in San Diego, Calif. took their salon to the next level with a little fresh air – yes, fresh air. The salon features a clean air filtration system to ensure top-notch air quality for both clients and staff alike, and also adds to the modern and clutter-free atmosphere. Sleek and stylish Wall-mounted Roller Ball F Multi-processors reduces equipment clutter due to its small design footprint and multi-purpose features. It also enhances the full-service repertoire of the salon. Additionally, custom cabinetry designed by Takara Belmont brings depth to the space through full-length mirrors, while tucked away side storage contributes to an uncluttered space. Natural, reflective and multi-tonal lighting solutions, paired with design and color scheme elements from nearby luxury apartment complexes, creates a perfect blend of at-home comfort and getaway oasis.